Years ago, most would’ve thought that dogs would want to “play” or socialize while their family is away. Why not? Perfect! This service could ease the guilt of being gone all day, one might think. 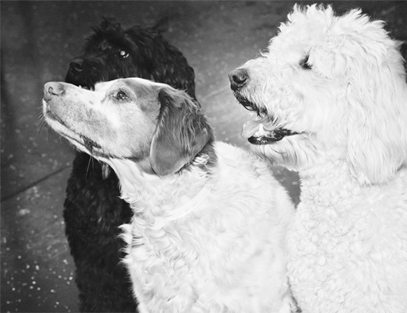 Most pet parents use doggie daycare centers regardless of how it affects their time and their budget mainly because their dog is part of the family and they wholeheartedly want to provide something special, that they just can’t provide from home. I was 21 years old when I started working at a dog daycare center called Yuppy Puppy. My formal education started at Trainers Academy for Obedience and Behavioral Sciences, which now has new ownership and is called Woofology, based out of Troy, Michigan. My experience there with phenomenal Instructors truly made me who I am today. I owe a lot to the entire team of wonderful people that I worked with who taught me everything I know. Back then, we were very adamant about the importance of training during the socialization process and to this day I am devoted to continuing that passion with my staff and my community of followers. When I decided to open Wag ‘N’ Tails Dog Activity Center several years later I was teased by everyone I knew since “doggie daycare” was such a new thing. So many people still had never heard of such a thing! A daycare center for dogs? I had friends who were graduating from college and going off to pursue fancy careers or “real” jobs and I was immediately nicknamed the “dog lady.” At that time in 1999, there were three dog daycares in three counties. Now there are 63 “dog daycare” centers, doggie camps, canine worlds, or dog-mania’s” located in my county alone in the state of Michigan. Over the years, things have changed. I’ve watched what was once a great idea to “poop out pups” while people are away, turn into a booming business idea that is quite frankly creating aggression and fear. There. I said it. Whew! Feels good. You see, this is the thing. Somewhere along the way, people got this wild idea that allowing 15, 20, 30 and even 40 dogs to intermix together in one room and “run wild and free” would be a great way to “poop out pups.” Although, the methods of training used with dogs that are intermixing in this manner is critical to any dogs success in the future. Especially when they are in the presence of other dogs outside of that environment on a leash for example or just simply on a walk with their owner later on. If and when methods such as squirt bottles of water are used in these play arenas or when adverse punishment methods are part of that interaction routine, this will many times cause behavior problems and can actually be counterproductive to the dogs success and comfort level, even on simple walks around the block. Group size and proper pairing of dogs must be considered. Many times at a typical dog daycare center it’s simply not possible to operate this way. In a school type environment, education comes first, not group size. Where along the way did we, as humans decide that dogs wanted to “party” with other dogs for hours on end? Well, I’m here to tell you that they don’t. If dogs could thank me (and they do every day) for letting the cat out of the bag, they would. Just because dogs are pack animals, that doesn’t mean they should be expected to get along with others simply because they are dogs. People are people, and many of them can’t even get along! Why oh why, would we expect it to be any different for dogs? There is an extreme amount of skill, patience and experience involved in controlling any environment with large pack numbers of canines. There is much to be said for offering short burst of time in order to “jazz them up and then settle them down” from the words of Dr. Ian Dunbar, veterinarian and dog trainer. There is a difference between constructive interaction which creates calm contentment in dogs, opposed to absolutely overwhelming them into pure and utter exhaustion. Short play and train times are difficult to maintain in a daycare center opposed to a school-type environment where education comes first and length of time is tailored according to each individual guest. 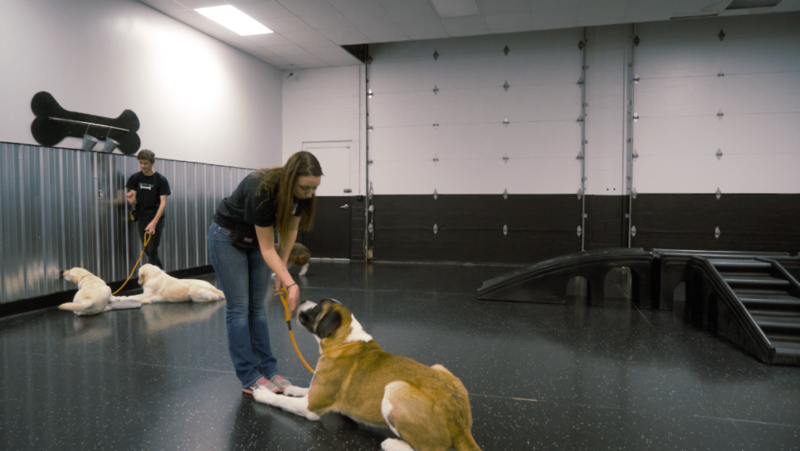 Wag ‘N’ Tails has serviced thousands of pets and their parents since 1999. Within that service we include the feelings of home. Walks outside to eliminate, quiet time, the sound of television, and most importantly, small controlled groups of socialization performed in a timely manner. These are just a few examples of how we simulate our care to feel like a home away from home. Our strategically planned groups of dogs always include activities such as counter conditioning methods using word cues and hand signals so we have off leash control from a distance. Dog School is in session when you bring your dog to Wag ‘N’ Tails and we pride ourselves on first teaching with leashes and eventually being able to maintain the same control without the leash in a group setting. Our talented group of dog trainers know the signs to watch for when play is becoming inappropriate or overwhelming to a dog. They are able to swiftly identify when a particular dog may not do well another dog based on size, age or temperament. 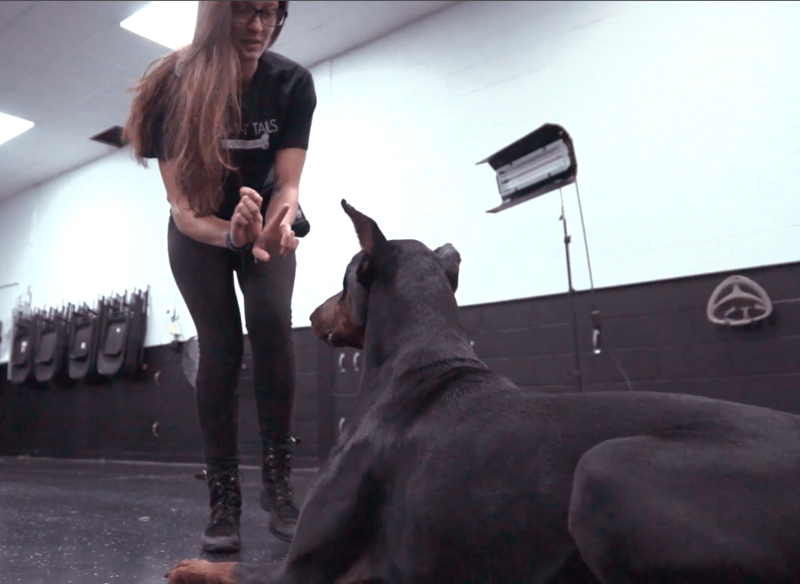 Our specially chosen staff is trained to keep a safe environment with the use of not only leashes and various motivational tools, they use control exercises that involve ongoing learning techniques. At Wag ‘N’ Tails, we offer an enrichment program which includes confidence building, education, prevention of fear and prevention of aggression. Do we play and exercise the dogs in our care? Absolutely! Our experienced “dog teachers” go through a significant amount of training to have the positions they proudly hold to offer safe play. We do have play and socialization as part of our service but it’s conducted in a very controlled setting using only science-based, force-free training. When you visit Wag ‘N’ Tails, you have chosen your dogs’ school, we sincerely take pride in offering a service that is truly hard to find. We will continue to strive at making sure that your dog continues to enjoy the benefits, while you enjoy them as well. With a well mannered, well-adjusted dog who can’t get in our dog house door fast enough and goes home confident, well mannered and happy! I live in Houston, Texas and somehow got on your email list. As a result, I was reading your Reasons for Calling it a School for dogs and got so excited, only to be disappointed. I was ready to bring my dog and sign up for a training class, but we spend the summer in Shelby, which is over 200 miles away. The philosophy is spot on and I’ve given much thought as to why most “Dog Daycares,” are just as you described. The people and especially the dogs are so lucky to be near such an enlightened facility. Thanks so much Linda! What a wonderful post response! If you follow me @christinefoxtv I’m soon launching an online community of dog lovers who put education first. I think you would really enjoy the content that will soon be launching. Join us! I would please like Christine Fox to contact me. My dog, Jolene Rae has been through one group training and one socialization evaluation through Wag N tails on 24 Mile Road in Shelby Township. Jolene has relapsed into a bad habit that has to be retrained. Please contact our office at info@wagntails.net. Let’s get you the help you need! We can be reached by phone at 586.781.6400.